Sangoma Technologies Corporation (TSX VENTURE:STC), a leading provider of hardware and software components that enable or enhance IP communications systems for both voice and data, today announced the launch of a new family of IP phones. Designed exclusively for use with FreePBX and PBXact and featuring Sangoma’s Zero Touch technology, which means they connect and operate quickly and easily, right out of the box. The product line includes the entry-level s300, mid-range s500, and the s700 for the most demanding business environment. Each phone in the three model series features Power over Ethernet (PoE), so no power cable or outlets are required. They have full duplex speakerphones, dual Ethernet Ports, multi-way conference calling, high definition voice, and have built-in Virtual Private Network (VPN) capabilities. 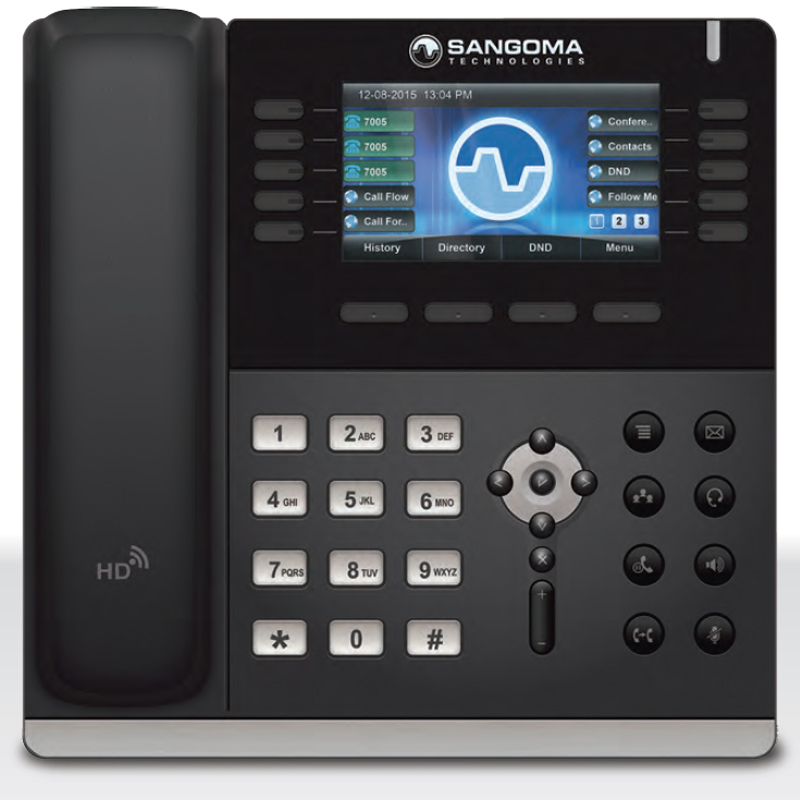 When customers buy and install any of these Sangoma phones, the redirection server automatically sends the phone line to the Sangoma Private Branch eXchange (PBX) for configuration. Other vendors have redirection servers, but they have to be pre-programmed with the IP PBX. Sangoma’s PBX solutions are available in two versions. FreePBX, an open source variant and as the PBXact brand, a commercial version. Both are available as software or can be pre-installed on telecom appliances. Only Sangoma can provide Zero Touch provisioning with FreePBX and PBXact. Each phone also comes integrated with Sangoma EndPoint Manager Software. The software enables users to control global settings, program phone keys, map extensions to MAC addresses and templates, upload images, download new firmware, and scan the network for non-provisioned phones. Sangoma phones also feature Plug and Play deployment; native VPN for secure connections; phone and user management from the PBX control panel; and soft key functions like call flow management, queue management, presence, etc. Since the VPN client software is included with the phone, remote users can easily and securely access an office-based PBX. There’s no need for a VPN router at the remote or home office location. The system also traverses firewalls automatically. Once Sangoma’s phones are installed, users can control advanced features directly from the phone. There’s no need to remember feature codes. There’s also no need to log in to the PBX panel to control the feature set. User applications include: Call Parking, Follow Me, Do Not Disturb, Conference Rooms, Call Forwarding, Time Conditions, Presence, Queues, Queue Agents, Transfer to Voice Mail, Visual Voice Mail, and Log in/out. s300, with 2 Session Initiation Protocol (SIP) Accounts, dual Ethernet capability, headset compatible and an MSRP of $89 (USD). s500 with 4 SIP accounts, a 3.5 inch full color display, 28 programmable soft keys, headset compatible, dual gigabit Ethernet capability and an MSRP of $149. s700 featuring 6 SIP Accounts, a 4.3 inch full color display, 45 programmable soft keys, headset compatible, dual gigabit Ethernet capability and an MSRP of $229. Accessories such as headset adapters and power supply units (for networks without PoE) are also available. All Sangoma telephones come with a 1-year warranty and extended warranties are also available. With this new line of smart VoIP phones, Sangoma can provide all the appliances, software and functionality a business needs for a sophisticated IP and Unified Communications system. Sangoma (TSX VENTURES: STC) offers a range of hardware and software for voice and data IP communication systems to enterprises, SMBs, carriers, and OEMs in more than 150 countries. Sangoma’s cost effective, quick to deploy, and easy to manage offerings include FreePBX, Session Border Controllers (SBC); the market-leading Express for Skype for Business; VoIP Gateways; Call Tapping; Call Center Software; and Signaling Gateways. Sangoma also continues to lead the market in VoIP-to-PSTN interface cards. For more information visit www.sangoma.com.